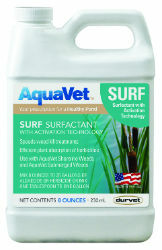 The addition of AquaVet SURF improves the absorption of post-emergence herbicides. With SURF, plants are covered better with spray and the herbicide also reaches depressions in the leaf’s surface and adheres to them. Not Approved for Sale in California. DIAGNOSIS: For enhanced control of waxy leafed weeds a surfactant may be used to aid the spray herbicide penetrate the plant. Dosage: To use as a surfactant mix 8 OUNCES of liquid with up to a 25 GALLON mixture of water and herbicide. . Frequency: Use when weeds are actively growing as an aid in the penetration and absorption of herbicides.